Website design, website promotion, website hosting and Search Engine Optimization are the principal businesses of Miyoji Productions. Web site development and web site marketing are as important to businesses today as telephones and credit card readers. In fact, web sites are now becoming more important than yellow page ads. We believe we can custom build a web site to perform the above tasks for any business. We also consider it part of our responsibility to help you, the business owner, to understand how your web site can work for you. Miyoji Productions designs and builds web sites of all sizes, from simple one page sites to complex multi-page web sites with database integration, flash movies and ecommerce. We design every web site from scratch. Do you have a piece of software you are using that you wish could be accessed by your employees or customers over the web? We create custom applications which allow you or your clients to do the same thing over the web that you do at your computer. Call us and find out how convenient we can make things for you and your clients, and how much money and time we can save you. Tired of getting a voice mail system when you call your web site hosting company? We actually answer our phones. Many people switch to web hosting at Miyoji Productions because they have problems contacting their old web site hosts. We even handle that problem during the transition. Web sites need to be maintained. Your business changes and grows. Your web site should change and grow with your business. We maintain web sites we build and web sites built by other companies. 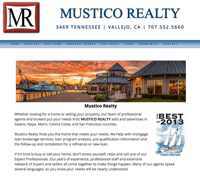 The Mustico Realty website features full screen responsive design. The home page wows with a beautiful photo of the Vallejo waterfront with the Vallejo to San Francisco ferry going out at sunset. 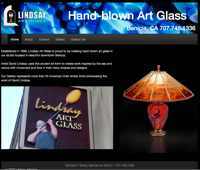 Lindsay Art Glass is a hand-blown art glass company. This is an example of non-full screen responsive design. The home page features a video and slideshow both of which are responsive all the way down to a mobile phone. 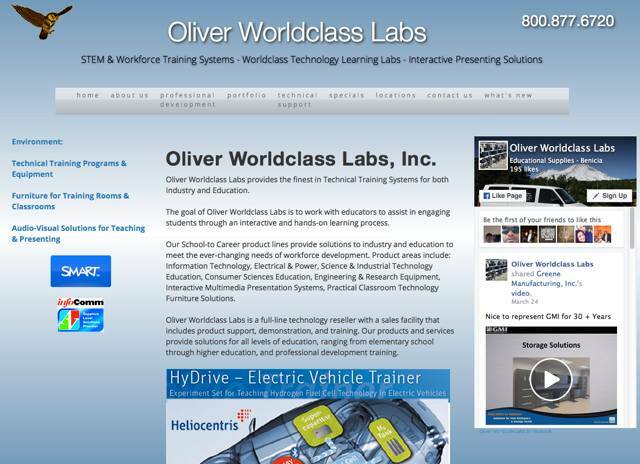 Oliver Worldclass Labs is an example of a site which was built before responsive design, but recently converted to full-width responsive design. Their logo even changes sizes as you resize your screen. The Rellik Tavern is built as a non-responsive website with a mobile component built by a third party. The mobile component detects when you are usine a mobile device and gives you the choice of the mobile version or the full website.